Creating Bootable USB Pen Drive using cmd is pretty easy. It does not requires any Specialized/Computer Engineering Skills. Anybody who is able to work on machine can create Bootble USB Pen Drive Using Cmd. But still if you can't get your hands on it, You can refer my last post. In my last post i wrote about how we can create Bootable USB Pen Drive for Windows 7/Vista Using Software i.e Windows 7 USB/DVD Download Tool by Microsoft . I also wrote "why we are creating Bootable Pen Drive" ! for that you can refer my last post. How to Create Bootable USB Pen Drive Using Cmd ! Step 1 :- Obtain/Collect the Windows OS files from somewhere and save it in your computer's hard drive. 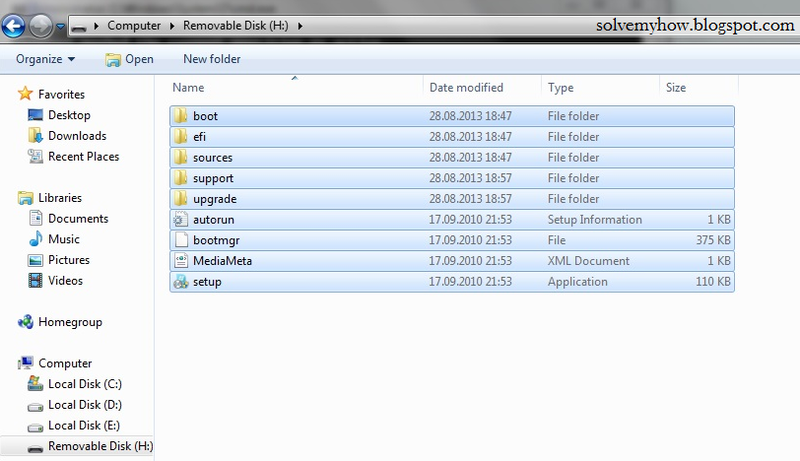 You can save it in any of the Drive by simply creating one folder. If you have ISO Image File of any Windows Operating System then you can open it with daemon tools, magic Disc or WinRAR. Just do remember where you are saving it i.e Drive and Folder ! Step 2 :- Plug-in your Pen Drive into your machine. Step 3 :- Open Command Prompt and run it as administrator . Windows 7 Users :- Go to Start Search >> CMD >> Right Click on it and Click on "run as administrator". Windows 8 Users :- Press Windows Key from keyboard and type CMD >> Right Click on it and Click on "run as administrator". On your CAPS LOCK [Optional] . Step 4 :- Type DISKPART [Press Enter]. Step 5 :- Type LIST DISK [Press Enter]. This will show you all the available disk in your system. DISK 0 is usually Hard Disk of your system. In my case DISK 2 is my USB Pen Drive (This can be different in your case so please make sure). You can identify it by seeing its size ! Step 6 :- Type SELECT DISK 2 [Press Enter]. Step 7 :- Type CLEAN [Press Enter]. This will Erase your USB Pen Drive. Step 8 :- Type CREATE PARTITION PRIMARY [Press Enter]. Step 9 :- Type SELECT PARTITION 1 [Press Enter]. Step 10 :- Type ACTIVE [Press Enter]. Step 11 :- Type FORMAT FS=NTFS [Press Enter]. This will format USB Drive and this may can take upto 10-15 minutes. So wait until 100% complete. Step 12 :- Type ASSIGN [Press Enter]. Step 13 :- Type EXIT [Press Enter]. This command will Exit the DISKPART Function. Step 14 :- Now you have to copy all the Windows OS files from the Hard Disk to the USB Pen Drive. Step 15 :- You're Done. Now, you can restart your machine and boot OS from your USB Pen Drive. Thanks man. I really loved your blog and the content you write. Anyways, piyush keep publishing awesome content. Thanks for stopping by and commenting. Paresh thanks for your feedback and kind words. I'm glad you loved our post and you found this helpful. Paresh do share this post with your social media friends on Facebook and whatsapp.